I awoke this morning to my phone buzzing with notifications. 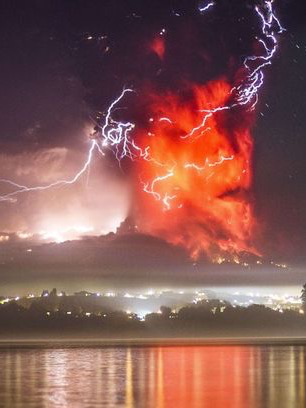 Not just the usual earthquake alerts and job search emails, but while I slept Calbuco in Chile had begun a tremendous eruption. Many of my friends and family had sent me tweets and links to eruption update; have to say it touched me that so many know my passion for these things. Figure 1. High out put of SiO2 quickly coloured the skyline with stunning pink and red hues. I have not yet found an estimate for the ouput of either eruption but it is very evidant that high levels of SiO2 were released as the skyline quickly appeared purples and pinks giving us some spectacular imagery of the eruption as seen in figure 1 above. Calbuco is sat near the tourist area of Puerto Montt in Southern Chilie. 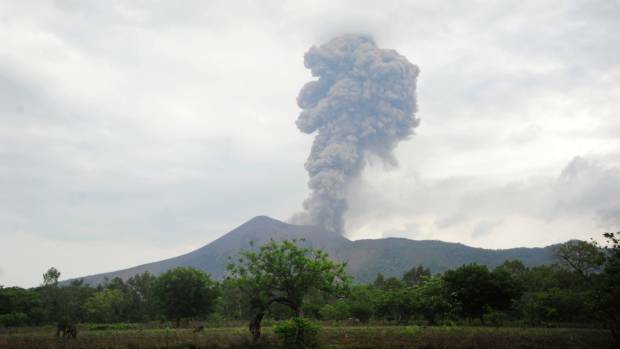 It is apart of the second largest volcanic chain in the world (Indonesia being the largest), but despite the high levels of activity in the region this particular volcano has been quiet for the past 42 years. This changing rapidly yesterday afternoon. Very little warning was given in the run up to the initial blast with a volcanic swarm occurring just before 6 pm local time and then the eruption began at roughly 6.15. A second spate of activity began around 1.05 am this time with lava being clearly visible through the pyroclastic material. The Bueno Aries VAAC puts the eruption column at 10 km (33,000 ft) although there is speculation from other sources that it is nearly double that. Chile has actually been relatively quiet volcanically this with only Villarrica giving us a show in March. This outburst is believed to be much larger and may be more prolonged. Calbuco, albeit quiet recently, actually caused one of Chile’s worst eruptions back in 1893-94. Although the seen seems to have calmed since the second blast it is strongly believed that this eruptive phase is not over and further eruptions may occur in the next few days or weeks. It is also thought a more careful watch will now also be made on Puyehue which often erupts at the same time of soon after Calbuco. Andean volcanoes are typically very explosive due to the andesitic lavas they produce.